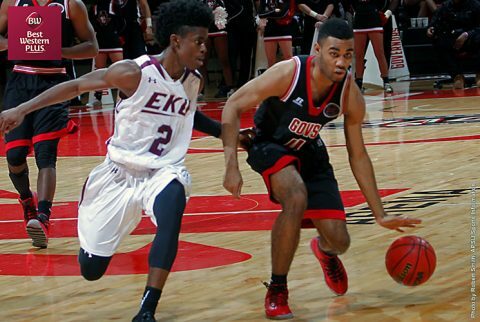 Clarksville, TN – On Thursday, February 15th, Austin Peay State University men’s basketball begins its final set of regular season home contests with a 7:00pm contest against Ohio Valley Conference West Division foe Eastern Illinois in the Dunn Center. Wins are paramount for the Governors at this point in the season—not only is head coach Dave Loos one victory away from 500 for his collegiate career, the Governors must pick up victories if they harbor hopes of a return trip to the OVC Tournament. Thursday night will be a Blackout Night—for the first time in the regular season, the Govs will don their black uniforms and fans are encouraged to wear black to the Dunn Center as well. Since snapping a five-game losing streak on January 28th, Eastern Illinois has become one of the conference’s hottest teams, winning four of their last five, including overtime victories against Southeast Missouri and Tennessee State and a win against West Division leader UT Martin. Montell Goodwin grabbed OVC Player and Newcomer of the Week honors last week after averaging 23.0 ppg, 4.0 rpg and 3.5 apg in wins against the Skyhawks and Redhawks. The Govs look to shake off a 102-58 road loss against the Racers that saw the teams split the season series. Although Josh Robinson (15 points) outdueled OVC scoring-leader Jonathan Stark (13), the Governors couldn’t overcome the Racers presence in the paint (62 points, most by an APSU opponent this season) and a minus-22 rebounding differential. 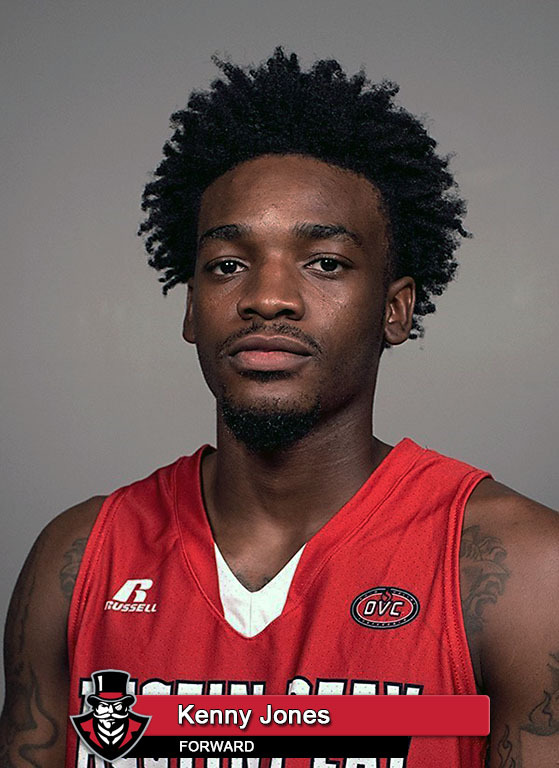 Josh Robinson poured in 36 points, chipping in seven boards and hitting five three-pointers, to pace the Govs to a 92-84 win against the Panthers, January 14th. 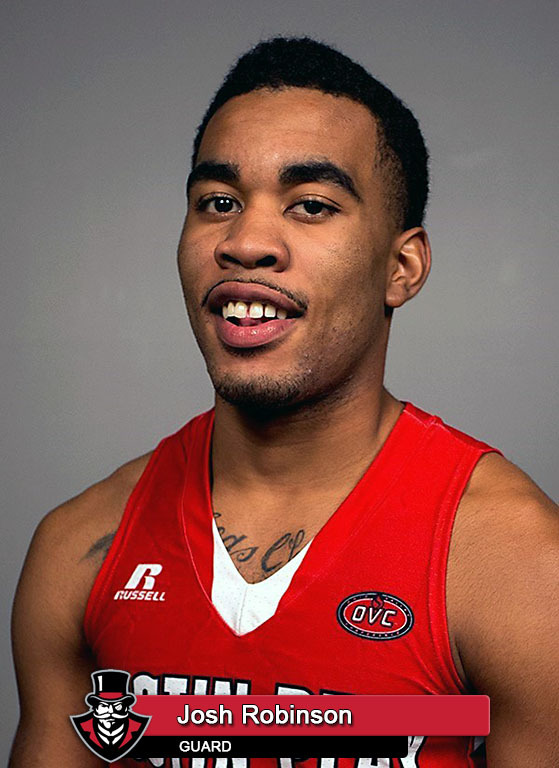 Kenny Jones chipped in a double-double (12 points and 11 rebounds) and the Govs hitting 12-for-20 from beyond the arc to counteract a 32-point, 12-rebound performance from Demetrius McReynolds–Muusa Dama also had 16 points and 10 boards for Eastern Illinois. A win would be the 500th in head coach Dave Loos‘ collegiate career. In 16 of 25 games this season, Jones has shot at least 60 percent from the floor. He ranks fifth (59.3 percent) in the conference in shooting among qualified players. He and EIU’s Muusa Dama are two of six players in the league’s top-10 in rebounding and shooting–Dama paces the conference in boards (9.5 rpg) and is 10th in shooting (52.0 percent), while Jones is ninth (7.8) and fifth (59.2), respectively. A win would give the Govs a season sweep of the Panthers for the first time since 2010-11 and would be Austin Peay’s third straight win against Eastern Illinois, the Govs longest streak since 2010-12 (three games). Sophomore Chris Porter-Bunton is shooting 49.1 percent (27-for-55) from the floor in OVC play. Terrell Lewis, EIU’s third-leading scorer, is a familiar face, if not name, for Austin Peay fans. Formerly Cornell Johnston, Lewis recently legally changed his name and is averaging 10.6 points and 4.8 assists for EIU. Josh Robinson is five points behind Lenny Manning (1981-84) for 12th all-time. Jones may be one of the league’s most efficient players, but he’s also had his share of bad luck from a numbers standpoint. Five times already in 2016-17, Jones has finished one rebound short of a double-double, including two of his last three games. Senior John Murry is averaging 18.8 ppg since the start of conference play, hitting 49.7 percent (73-for-147) from the floor and 79.3 percent (65-for-82) from the free-throw line.